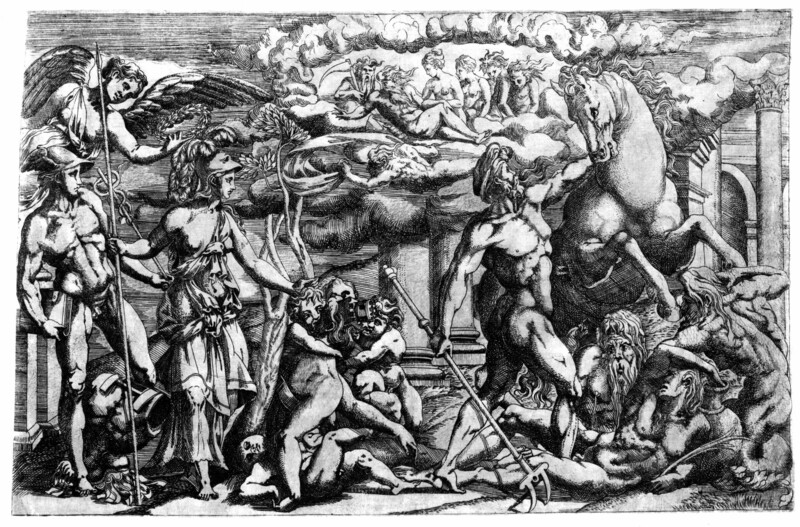 Etching by Antonio Fantuzzi, 26.2 x 41.1 S (New York). Heinecken, IV, 1790, 533, as Leon Daven after Rosso. Bartsch, XVI, 1818, 402, 68, as Anonymous, School of Fontainebleau, but appears to be by Fantuzzi. Herbet, II, 1896, 277-278 (1969, 73-74), 26, as Fantuzzi after Rosso. 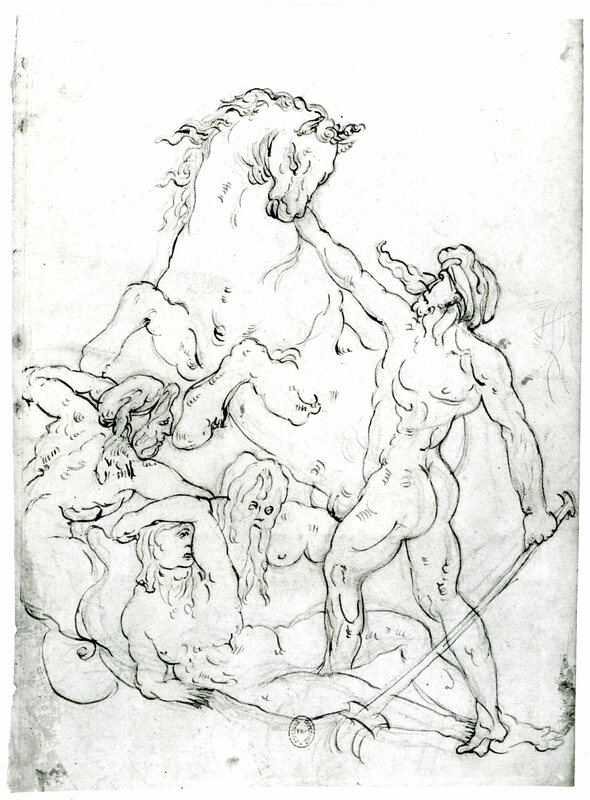 Zerner, 1969, A.F.32 (New York), as 1542-1543, after Rosso. COLLECTIONS: London, 1850-5-27-101. New York, 49.97.589. Paris, Ba 12 (2 impressions, one damaged); Eb 14d; Ed 8b Rés., Vol. II, no. 25 (stained along bottom). Poughkeepsie, Vassar College, Frances Lehman Loeb Art Center, 86.2 (trimmed on all sides). Vienna, Vol. XIII, 2, p.81, no. 455. Mariette, Abécédario, 1858-1859, as after Rosso, and by the same etcher who did the Death of Adonis [E.76]. Kusenberg, 1931, 164, as Fantuzzi after Rosso. Panofsky, 1958, 172, Fig. 55 (wrongly as Boyvin), 176-177, n. 112, as Fantuzzi after Rosso. Béguin, RdA, 1969, 105, mentions a partial drawn copy in the Louvre (on which, see below). Zerner, 1972, 115, 119, Fig. 181. Zerner, in EdF, 1972, 265, no. 312, and in Fontainebleau, 1973, I, 100, Fig. 74, II, 83, no. 312 (New York), as probably 1542. Zerner, IB, 33, 1979, 343 (New York). Borea, 1980, 261, no. 661 (Paris, Eb 14d), as Fantuzzi from a fresco by Rosso. Lévêque, 1984, 245, Fig. (New York), as perhaps for the Gallery of Francis I.
Rubin, 1987, 93-94, Fig. 196, as the model for Salviati’s Conversion of Paul, in the chapel in the Cancelleria, Rome. Carroll, 1987, 302-304, no. 96, with Fig. (New York). Boorsch, in French Renaissance, 1994, 238-239, no. 39, Fig. (Paris, Ed 8b, Vol. II), although there is no proof that Rosso’s composition was made for the Gallery of Francis I, it may have been designed for one of the rectangular areas above the roundels of the East Wall, and perhaps for execution in stucco, as space in the composition is very shallow. Carroll, 1995, 303, the winged figure female and hence Victory and not a Genius. Meyer, 1995, 295, n. 27, 296, Fig. 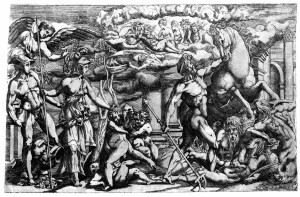 3 (New York), as perhaps Fantuzzi and after a lost painting at the East End of the Gallery of Francis I.
Rosso’s authorship of the composition of this print has never been questioned. Stylistically, it closely resembles his Pandora and Her Box drawing (Fig.D.67a) and would seem to have been invented about the same time, around 1536. On the possibility that this scene originally had a place on the East Wall of the Gallery of Francis I, see the catalogue entry of the decoration of that room (P.22, East Wall). 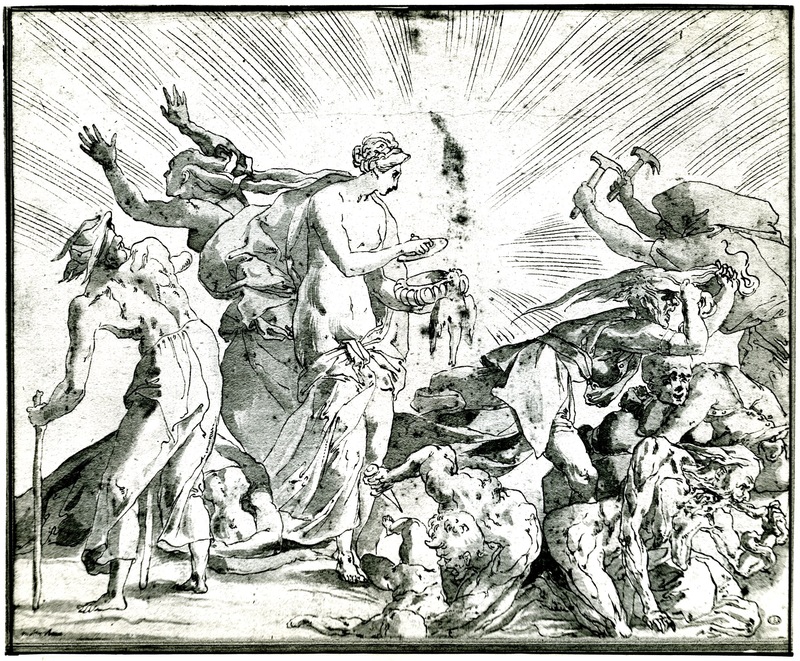 The etching is probably dependent on a lost drawing by Rosso known from a partial copy (Fig.D.66). 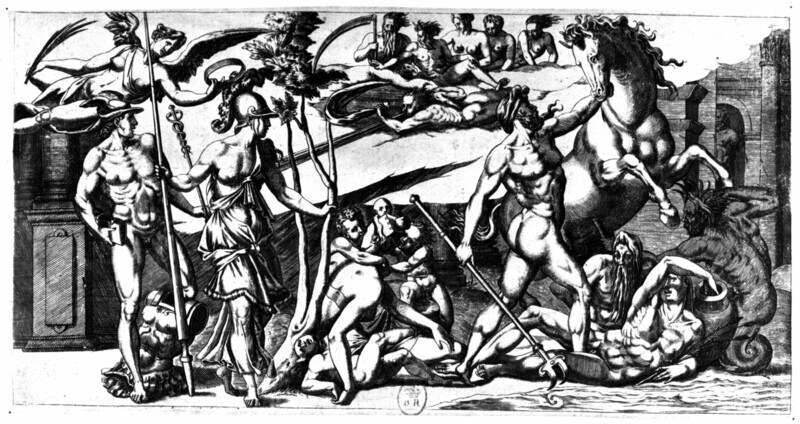 With due recognition given to Fantuzzi’s own style as an etcher, the print nevertheless shows everywhere Rosso’s specific kinds of figures, groupings, and overall design. The drawing on which the etching was based was probably done later than the one used by Boyvin for his engraving (Fig.E.13), which has some slightly different, as well as some more schematic, details. Although without the monogram generally assigned to Fantuzzi, the etching has always been recognized as his.